Here comes the sun doudou-doudou. Wait what? In my case it's Here comes the drums bombom-bombom. Crazy right! I have to make two of these! Everything is pretty simple since I already have the Golden Pearls and I can get the Sunstone pretty easy thanks to a friend of mine. The only trouble will probably be the Conga Drum. I do not know where to get this but I have heard it is somewhere in Celestia. I might go snooping soon but anyways, this is a challenge. Well as Neil Armstrong said, "That's one small step for Man; one giant leep for Mankind." This is a huge leap from some of the other Crafting Quests but I think that this quest is perfectly challenging. I'm up to it. Are you? 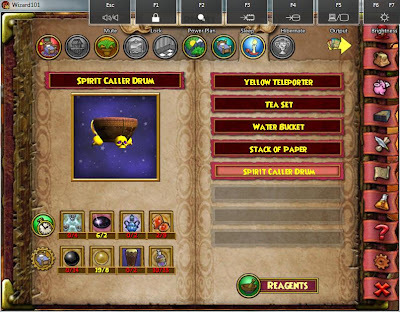 I'm not sure but I think the conga drum is sold by the housing merchant in Celestia.